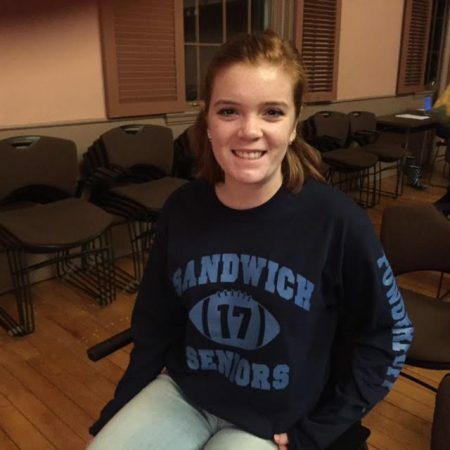 On November 16, 2016, Bridget Carl, SHS Senior and Student Representative to the School Committee, arrived at the School Committee following a victorious Powder Puff Football Game at SHS, to present the following report. Thank you to the PTA for their support of the music program through the cultural events they provided last month. 3rd and 4th graders were treated to a Woodwind Quintet and 5th and 6th grade got the opportunity to enjoy a Jazz Band performance. This week, our 4th graders will travel to Barnstable High School for the Cape-wide Young People’s Concert. Last week our students celebrated Veteran’s Day in a very special way. Veterans from all branches of the military, those who served in battle and served during peacetime had a visit by a veteran in their 7C’s classes. The experience was very meaningful to both the kids and to the veterans. Coming up this month the 3rd graders will be off to Plymouth Plantation, thanks to the PTA. The kids raised over $1500 for UNICEF!! A successful collaboration between SHS UNICEF Club (part of International Studies Club) advised by Mr. Franke and Oak Ridge Student Council advised by Ann Kelly. Kids in grades 3-6 raised over $1500 through their participation in Trick-or-Treat for UNICEF. This money will be sent on Monday directly to UNICEF headquarters in NYC which helps provide child refugees with food, shelter, and education. Sandwich has made a huge difference today! Thank you trick-or-treaters and generous families! Finally, this week our students will celebrate Gratitude Week. Please take some time to talk to your children about all of the things they have to be grateful for. The STEM Student Council has launched its annual food drive for the Sandwich Food Pantry. In addition the students are also collecting for the Toys for Tots program. The STEM Academy students will be participating in the Science on the Street program again on March 18. This is sponsored by the Cape Cod Community College, the Cape Cod Museum of Natural History, and the Cambridge Science Festival. Students from science and engineering classes will be presenting their projects to the public. Also the STEM engineering students will be participating in the Engineering Design Challenge sponsored by the Cape Cod Community College. Preliminary plans are to have a STEM night for parents in January in the new Makerspace area of the library. Dr. Gould and Mr. Newton met with representatives from the Cape and Islands Boy Scout Council and the STEM Academy will be sponsoring their STEM Journey this year scheduled for March 4. The program is moving from the Cape Cod Community College to STEM and Sandwich High School. Last year over 1400 attended the event in which there were many organizations and hands-on activities for students of all ages. The keynote speaker will be Dr. Luke Roberson from NASA at the Kennedy Space Center. The STEM Academy’s first Winter Art Show is scheduled for the evening of January 10.All first semester students in the art program will be showcasing their work to the public. Sandwich High School sends a resounding round of applause to its post season athletes in field hockey, cross country and cheerleading for outstanding seasons! So proud of our Blue Knights!!! One more week until tryouts for winter sports as SHS and STEM students prepare for their long awaited seasons! Opening weekend for Knight Theater Company It’s A Wonderful; Life was a great success! Don’t miss this great show when the curtain goes up next week Friday and Saturday night. Fall induction or National Honor Society took place this past Monday, November 14 at SHS. Congratulations to the deserving students and welcome to National Honor Society! Congratulations to SHS Key Club officers as they work with our STEM students in a new facet of Key Club called Key 2 Be. The collaborative effort of this organization will be focused on a Cradle to Crayons campaign. Student Council will be working will be coordinating the Toys of Tots effort for the Joint Base of Cape Cod. All students grades 7-12 took a few minutes to complete the survey faced on providing data for the upcoming District Strategic Improvement initiative. Students appreciate being asked of their views. Thank you. Last Thursday four physics students including myself went to a marine turbine research and development talk at UMass Dartmouth with Dr. Anderson. We were surrounded by global entrepreneurs, students, and local business people. The talk was about different sustainable energy technologies that utilize either tide, wave, or offshore wind. There was a focus on a tidal marine turbine being installed in the cape cod Canal by the railroad bridge, an initiative led by a local business, the US Army Corps of Engineers, and UMass students.